If you love to sing, you are among friends at Princeton. Students come together in groups large and small, formal and informal, to make vocal music together as often as time allows, and on every corner of campus. There are student led a cappella groups (more than a dozen, actually!) early music ensembles, an opera company, countless music theater productions, two excellent local church choirs and of course the PU Chapel Choir… and here in the music department, at the heart of it all, we have three wonderful choral ensembles – the Trego Singers, the Princeton Chamber Choir, and the Princeton University Glee Club. Read on to find out which choir is right for you! 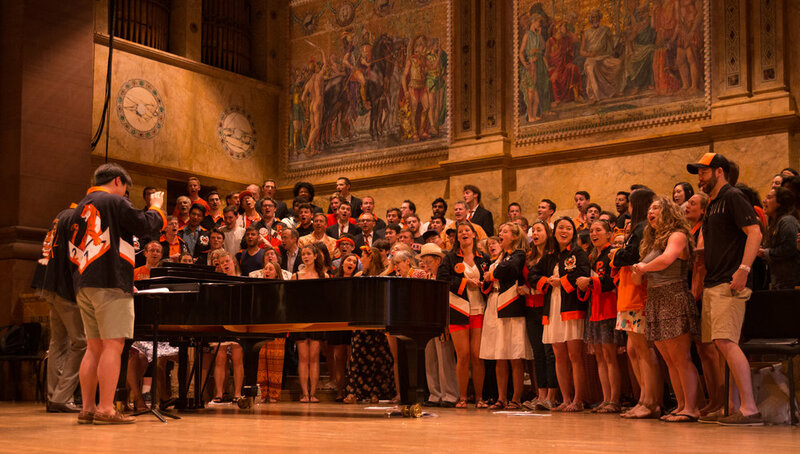 The Glee Club is the oldest and largest choir at Princeton University, and has for generations served as the ‘hub’ for singers at Princeton – in which like-minded students come together to explore musical passions and make lifelong friendships. The choir tours internationally on alternate years (at no cost to the students! ), and has recently added Argentina and South Africa to the list of stamps in the Glee Club passport. There are five major performances each year, and numerous special appearances at functions and gatherings around campus. The choir's most celebrated performing tradition dates from 1913 – the annual concerts presented jointly with the Glee Clubs of Harvard and Yale Universities on the eve of the respective football games. A more recent tradition has seen the establishment of annual performances of choral masterworks with professional soloists and orchestra. In the last few years these have included Mendelssohn's Elijah, Bach's St. Matthew and St John Passions and Mass in B minor, Mozart's Requiem and Verdi’s Requiem. The choir's repertoire is extremely diverse, embracing anything from Renaissance motets and madrigals, Romantic part songs and 21 st century choral commissions to the more traditional Glee Club fare of spirituals, folk music and college songs. The spectrum of Glee Club members is perhaps even broader: undergraduates and graduate students, scientists and poets, philosophers and economists - all walks of academic life are represented, all knit together by their belief in the nobility and joy of singing together. Auditions will be held between September 10th and 14th, 2018, morning and afternoon. Sign up for a 10-minute slot here! Members of the Glee Club are eligible for subsidized studio voice lessons. For information, call the Music Department at (609) 258-6078. Fridays 4:30 to 6:00 p.m. The Chamber Choir is a select group of 25-30 mixed voices that sings a range of challenging music from the Renaissance period through the twenty-first century. Most of the choir’s membership also sings in the Glee Club. This ensemble performs in concert with the Glee Club as well as on a separate concert series, and is frequently invited to perform off campus. Because of the advanced repertoire and relatively light rehearsal load, a Chamber Choir member possesses a high level of musicianship, and normally has some experience of high level choral singing. Recent repertoire has included Bach's complete motets, Lassus’ Magnificat Praeter Rerum Seriem and Handel's Dixit Dominus. As with the Glee Club, Chamber Choir auditions will be held between September 10th and 14th, 2018, with small group callbacks to be held early the following week. Sign up for a 10-minute slot here! Freshmen and sophomores admitted to the Chamber Choir must also sing in the Glee Club. The Chamber Choir rehearses twice each week beginning Monday September 24th, 2018, with rehearsals taking place on Monday and Wednesday evenings from 7:30-9pm in McAlpin Hall. As with the Glee Club, members of the Chamber Choir are eligible for subsidized voice lessons. Bill Trego is the revered former director of the Freshmen Singers at Princeton University, and for a brief spell too was the director of the Glee Club. In 2014, we decided to honor his legacy at Princeton, and in particular his great gift for instilling in young singers a passion for making music together, by naming a new choir within our department ‘The William Trego Singers’. Lovingly called 'Treegz' for short, this ensemble is simply a community of Princeton humans who love to sing. Among its members, you'll find many undergraduates from all classes, graduate students, staff, sets of roommates, and even siblings. Through the study and performance of repertoire chosen from across the entire range of choral literature, singers develop as musicians while building connections with each other and welcoming new members all throughout the year. Known for its warm inclusivity and nonsensical marketing campaigns, Trego especially likes performing in open spaces that attract audience members who might be new to choral music. As with the Glee Club, Trego Singers auditions will be held between September 10th and 14th, 2018. Sign up for a 10-minute slot here! The Trego Singers rehearse on Tuesdays and Thursdays from 5-6:30 in McAlpin Hall, beginning September 18, 2018. Tuesday, September 11th, 2018 at 2:00 p.m.
Meet members of our department choirs and find out about opportunities for choral enthusiasts. Make new friends, enjoy some impromptu music making and find out about rehearsal schedules, repertoire and upcoming concerts for the year. Sign up for a 10-minute audition slot here!